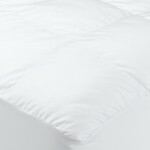 Products from the Beyond Down® Collection are filled with luxurious synthetic down that emulates the finest 600-fill power European white goose down. Click the images below for larger versions and more details. 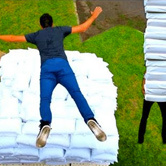 The Beyond Down® Synthetic Down Bed Pillow is completely adjustable, this pillow conforms to your head and neck for the best comfort and support available. The traditional shape pillow is perfect for all sleepers, particularly those who sleep on their back or stomach and the side sleeper pillow has a 4.5” gusset that provides perfect support for side sleepers. 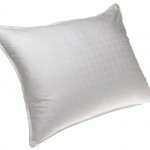 The pillow features a 300 thread count cover made of 100% cotton and featuring an elegant windowpane design. 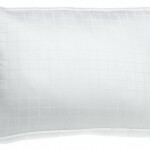 The pillow is hypoallergenic and machine washable for easy care. The gel-coated polyester fill in the Beyond Down® Comforter and Fiber Bed give them the same slippery and pliable lightweight feel as a down comforter, but is hypoallergenic. The beautiful 300 thread count, 100% cotton cover on each features a double needle corded edge and baffle box construction. The Beyond Down® Mattress Pad offers cloud-like comfort for the entire body and is perfect for all types of sleepers. 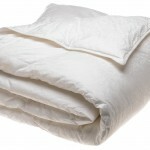 The 300 thread count, 100% cotton cover features a baffle box design to cradle the body in comfort. The 14-inch spandex skirt will stretch to fit most mattresses. The Beyond Down® Synthetic Down Mattress Pad is hypoallergenic and machine washable for easy care.